“Wild horses are the only animal in our country to be defined not by what it is biologically, but by the land it stands on. Wild horses are a resource under law, like a blade of grass, to be preserved and protected. In the 19th century western expansion saw ranchers/farmers purchase parcels of land that they felt were of value. Areas where a lack of water sources, in higher elevations, etc that made the land less desirable for livestock they left the land to public domain. Ranchers would use lands in the public domain for grazing as well, but felt they were not valuable enough for purchase. In states like Nevada that amounted to 85% of the land base. Not until the 1976 enactment of the Federal Land Policy and Management Act (FLPMA)did the BLM have a multiple-use, sustained-yield mandate. Why do yesterdays practices continue today? Why do the practices of the past continue that have been proven to create damage to the ranges and destroy the resources required to sustain other users, including wild horses and burros? Think about how our legislative process works. If a rancher faces restrictions he can go to his Congressional Representative or State Legislator to represent his interest. In many states the state representative IS a rancher. In many western states the Congressional representative either is, or his family is, a rancher. Congress has the power to restrict budgets and thereby target a district that restricts permits. In the eleven western states approximately 254 million acres of federal public lands managed by the U.S. Forest Service and the Bureau of Land Management are grazed by domestic livestock. To keep that in perspective BLM manages only 26.9 million acres for wild horses (and within the areas managed for wild horses livestock is given more than 80% of available forage). Grazing also occurs on many wildlife refuges and within National Parks, among them Grand Teton National Park (WY) and Great Basin National Park (NV). Although current law allows a “multiple use” of public land our public lands are not managed with a “balance” of use approach. Many uses such as wild horses and wildlife are simply left scraps. Multiple use can be attained but the truth of the current “prioritized” practices must be recognized and corrected. Proponents of ranching on public land make claims that public land ranching “feeds the masses,” creates jobs and that livestock ranchers are “good stewards of the land.” Proponents claim wild horses are destroying the ranges and must be removed. Let’s look at the facts, shall we? Our 11 western states that have ranching on federal public land provides less than 18,000 jobs (0.06% of total jobs). About 22% of ranchers in these states actually hold federal grazing permits (BLM and USDA 1994: 3-65). On a national basis, these ranchers represent only 2% of America’s 1.1 million cattle operators. Public land ranching produces only 3.8% of the nation’s beef cattle, according to the U.S. Department of Agriculture (Rogers and LaFleur 1999). Feeding the masses and keeping western states employed? I think not. 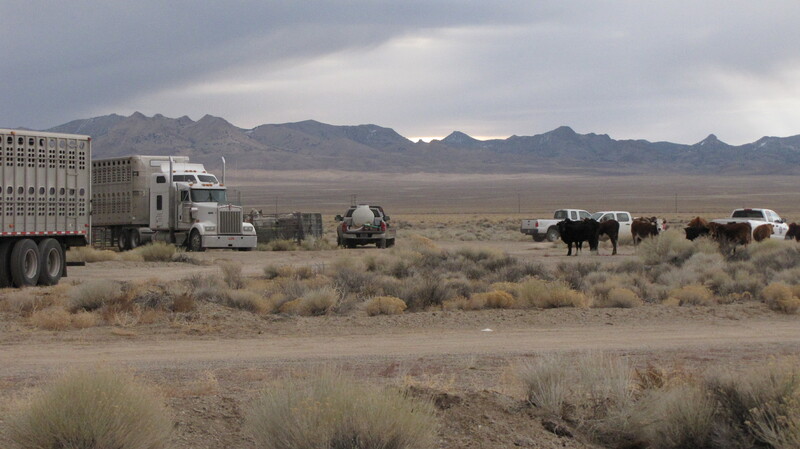 Public land ranching has destroyed any semblance of “natural balance” on the range. Predators that would diminish livestock profits are eradicated. Fence lines to stop cattle from moving criss cross our public land creating areas of overgrazing and destroying any natural movement. (In many HMAs where horses are managed more than half the area is cut off by fencelines). Overgrazed land will often be reseed with nonnative grasses and destroy the natural grazing plants native wildlife are dependent upon. Water hauls create overgrazed areas as cattle do not like to move away from a water source. Good stewards? I think not. Arguments used against wild horses in this debate are not based on facts, but emotional prejudice. It is an interesting phenomenon that those advocating for the welfare of wild horses are accused of emotional, non-factual argument by those engaging in emotional non-factual argument as they fight to maintain a subsidy (or welfare) program that reaps a profit line that the rest of us pay for. Let’s first look at costs. A huge push is being made to slaughter horses, both domestic and wild, by those that support public land ranching. They claim that it is “impractical” to continue paying for the wild hose and burro program. As the program has been mismanaged for decades with a “remove them” for profit feral livestock mindset the program is out of balance with focus on wild horses in holding instead of managed appropriately on the range. But to manage them appropriately on the range you first have to have a range to manage them on. A range currently run into the ground by livestock (and extractive) industry. That may seem like a lot of money if you have nothing to compare it to. However let us look at the cost to the tax payer for public land ranching. The National Public Lands Grazing Campaign (NPLGC) estimates the cost to tax payers of public land grazing to be in excess of $500. million dollars in direct and indirect costs. Ranchers will claim that after the costs of fencing, fuel, permit fees etc that there is no “subsidy.” I do believe that private ranchers have the same expenses yet they are required to pay property tax on their land instead of a permit fee (remember a permit fee is about $1.35 for what it costs a private party between $10-$15 currently to maintain). When you point that out a rancher will cry “poor” as he tells you about how “hard” things are. I am sorry but in an economy where unemployment, lack of healthcare, education, etc. plague the vast majority of Americans that is an emotional argument. I know many people that would love to run their business at a fraction of the cost of their competitors, in this economy or any other. Remember the fee was 5 cents in 1906, the equivalent of $1.14 today; in 2008 the fee was $1.35 (and in most areas is still $1.35). In 2008 the BLM themselves did a study called “Assessment, Inventory and Management” and the first recommendation to making the agency solvent was a “full cost recovery system” which would require all permitees (livestock AND extraction( to cover the cost of the permit. That recommendation was never adopted. So let’s look at the cost a bit closer. If the NPLGC overestimates the costs by half and the cost to tax payers is only $250 million, the cost of the entire wild horse and burro program pales in comparison at $74.9 million. It is safe to say that public land grazing (with the 4% of livestock utilized in industry) creates a far larger burden to tax payers as a whole. Another argument based on emotion, rather than fact, is the assertion of over-population of wild horses. When you look at the land base and allocation of forage in comparison you see just how small the wild horse issue really is. 254 million acres of public land are managed for livestock grazing. The BLM (manages by far more wild horses and burros than all of the other jurisdictions combined) has 26.9 million acres managed for wild horses and burros. Now let’s look at the 26.9 million acres managed for wild horses and burros. More than half of the areas currently managed for wild herds are below 100 reproductive animals. That means that the agency is managing them at populations that threaten ability to survive drought and disease creating areas where human intervention (costs) actually increases. The areas where wild horses and burros live are managed under “multiple use.” Livestock is given more than 80% of available forage even in the small pockets of public land where wild horses exist. The argument of over population (and current flaws in management practices) seen to stem more from ingrained historic prejudice than from any scientific facts. In 1971 President Nixon signed into law the Wild Free Roaming Horse and Burro Act .The Act was intended to curtail “mustanging.” Mustanging was an unregulated brutal practice engaged in by many ranchers and private individuals to eliminate wild horses and profit from it by selling them into the fertilizer and dog food markets. This practice led Congress to declare these animals “fast disappearing from the American landscape” and in need of protection from “capture, branding, harassment and death,” and handed the honor of protecting and preserving them over to the Bureau of Land Management (BLM). Water hauls on public land to facilitate cattle. Does this look like a “good steward” to you? Many ranchers still resent any interference with public land grazing from the federal government. The wild horses that were found on the range were seen as a “public” resource by ranchers in these areas. The wild horses were used just as the land was, as if it were private property and not belonging to the American people. Ranchers would release personal stock onto the range in order to create a product they desired. The animals were “harvested” and some used on the ranch. The vast majority were sold for fertilizer and dog food creating an opportunity for more personal profit from public resource. Most people in the west know someone that profited from “mustanging” and many ranchers that hold permits today were mustangers. Since the passage of the Act inhibited profit from mustanging the animals are viewed simply as vermin by most. They are seen as competitors for a resource that has been overgrazed for more than a century by European cattle. In order to reap as much profit off of public land as possible all competition must be removed. In order to forward an agenda of removing wild horses from public land another false assertion has been perpetuated. That assertion is that these horses are “invasive” and do not belong on the land. After all these horses belong to them just like our public land, right? There daddy or grand daddy put them there. This assertion is also false and based on emotional prejudice. North America was actually the birthplace of the modern horse. You can read more about it here>>>. Wild horses and burros are not managed in a “balanced” approach. Powerful users such as livestock and extraction are prioritized on public land asserting to be for “public good” as they reap private profit and destroy public land. Wild horses and burros are a scapegoat for those that fail to recognize the truths on public land. Livestock grazing on public land, or “welfare ranching,” creates a huge burden to the range and the tax payer.